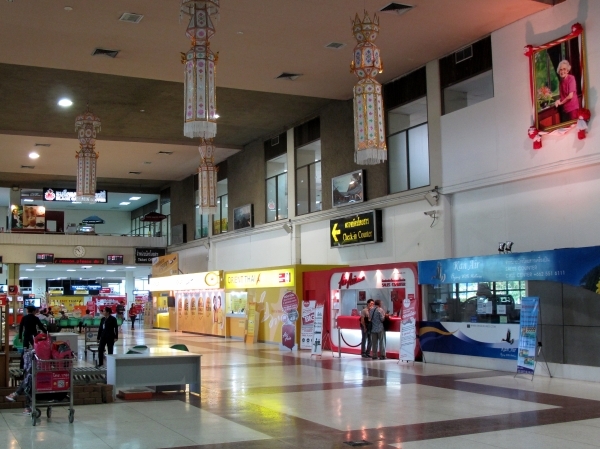 Chiang Rai's airport is really rather small, with only about half a dozen flights a day. Although it has international facilities, the airport does not seem to get more than the occasional flight from Southern China in the high season. The airport is all on one level, although there is a second floor which houses offices and a couple of restaurants. Arrivals uses the south end of the building while departures occupies the north. In between are several small shops selling local products. When departing Chiang Mai, note that you and your bags must pass through a scanner to get into the airport building. Check-in counters for all flights are located at the north end of the ground floor. For information on all the sights and experiences of the city, see the free on-line Thailand for Visitors Chiang Rai travel guide.